On 21st April 2016, Queen Elizabeth II will become the first reigning British monarch to reach the age of 90. To celebrate, I'd like to share with you my painting of Mintaka with British Floral Emblems. 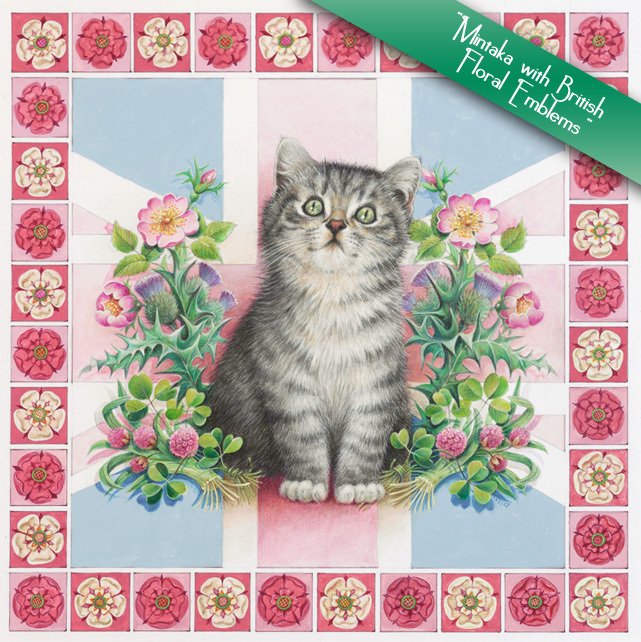 Mintaka, our Pedigree Sliver Spotted British Shorthair, was born and bred in England. Here in my painting, he is surrounded by stylised floral emblems, symbolising the four countries of the British Isles. Part of the British flag is in the background, in muted tones, which do not distract from his soft furry presence in the heart of it all. English roses are close to his heart, their wild briars grow in our garden, and in the hedgerows along the lanes where we live. White and red roses represent the Houses of York and Lancaster. The first War of the Roses took place in Mintaka's home town, St. Albans. Not that he was ever aware of that, wars are not his scene at all, a more loving and peacefully minded little cat would be hard to find, which is why I chose him particularly, to represent the image of peace and harmony among our countries. My Father was in the York and Lancaster Regiment in WW1, and thankfully for me survived. He loved cats and would have just adored Minty. The roses are a personal tribute to him, and to his bravery. I still possess the badges from his uniform with the Rose and Cat design, innocent of their personal significance for me. I must have subconsciously thought of these when painting this design, which I hope in it's very small way, may contribute to commemorate one of the most unique and special occasions in our history. Salutations to Queen Elizabeth 2nd. It is HER day after all.